What do they look like with a binocular or telescope? Telescopic or binocular observations should potentially be definitive examinations of these lights and reveal what they are, but the results are rather mixed. As usual, there is considerable ambiguity whether everyone is seeing the same kinds of lights. Even naked eye viewers are told that some of the lights are car lights, but 'old timers' insist that not all of the lights are from cars. Even if all the telescopes and binoculars see tail lights, this will not resolve the other persistent story of the non-car lights. Car lights could easily be discerned by their regular motion and color. Other lights would suddenly appear, move slightly, split into multiple lights, and show a distinctly different color and motion. They were not at all head lights. 4... the blinking observed was due to a Light passing behind a rock and being eclipsed by it. 6... that several of the balls were doublets. 8... Indistinguishable with the naked eye, these balls were obvious pairs through the telescope. 4... Through the telescope I could see hints of extremely faint ones that were headed in the opposite direction, as red as taillights. 1... Most of the lights appeared in pairs. When they were about to disappear they got closer and created a cone of light to the side and then red lights were visible behind them. 2... The NEVER lifted of the ground and as a matter of fact we saw bushes come in the foreground when these lights passed between us. 4... My suspicion at this time is that some one is staging this entire hoax. 4... As I began to think about how far away I was from the mountain, 15 miles, I realized that to see a clearly formed disk meant that the object must have been the size of a house! 5... On one occasion I observed one light split into four lights. These four lights were perfectly aligned horizontally and equally spaced -- a sure sign of some kind of man made hoax -- right? Equipment: 14x70 Fujinon binoculars, a 60mm. Bushnell Spacemaster with a 22 power wide field eyepiece, and a custom 4.3 in. APO refractor. 21..."We arrived at the viewing sight well before sunset...A careful inspection of the view toward the southwest showed that parts of distant Highway 67, which runs between Marfa and Presidio could clearly be seen through the telescopes. Cars traveling along the road would be visible for seconds to minutes, and then vanish around a curve or in a dip in the road. As the Texas landscape darkened the cars vanished and were replaced by moving lights, red or white, flickering in and out of view. With the naked eye, they did look rather strange, but the telescopes revealed the paired headlights and taillights of cars. While we were there, people arrived to look for the lights. Most quickly spotted the car lights along Route 67, exclaiming, ``There they are!'' Those who looked through the telescopes quickly realized they were nothing unusual. At one point a school bus pulled up, and a group of people got out. The driver launched into a pitch about the Marfa lights, while pointing out the lights along Route 67. They group soon jumped back on the bus, heading home with the knowledge that they had seen the strange and unexplained Marfa lights. Two years later we spent a night in Marfa itself, at a motel sporting a ``Home of the Marfa Lights'' banner. We again visited the official viewing sight, although this time we left the telescope behind. We were not surprised to find people were still pointing to the distant car lights on Route 67 as Marfa Lights. We got to talking with one gentleman, and explained our experiences two years earlier. He admitted some of the lights certainly could be from cars on Route 67, but claimed that the colors were wrong on many of them and that they must be something unusual. At one point he even pointed down Route 90 toward Marfa, claiming the approaching headlights were something else entirely! It would have been nice to have the telescope along, but I doubt he would not have been convinced even then. Some people have a strong desire to believe they have seen something exceptional, and people have a strong tendency to see what they expect. This combination can easily turn the mundane into the unusual. It can also turn the unusual into the bizarre. (http://www.rensselaer.edu/~sofkam/isuny/Journal/vol1_1.html skeptics3.htm ca 1987 Alan French) I emailed him on February 12, 2001. 26... Jeff and I had been attending the Texas astronomy party, so I had my eight-inch diameter Celestron telescope with me. For over an hour, I was too fascinated by the Lights to even remember the telescope, but eventually I brought it out of the car and set it up. With this telescope, the Lights were resolvable into obvious fuzzy round balls, apparently several feet in diameter. The telescope verified several observations, and provided several more discoveries. The most significant observation was that the lights truly were all the way to the mountains. The view through the telescope allowed each viewer to verify that the lights were passing behind rocks and cliffs ON the mountain side. Indeed, many, but by no means most, of the blinking observed was due to a Light passing behind a rock and being eclipsed by it. The light shed from the Marfa Light was more than enough to illuminate the rock wall behind the light. Rocks to the front were obvious from their silhouettes. A fascinating discovery from the telescope was that several of the balls were doublets. Often, a single light would appear, and about fifteen to thirty seconds later, a second, identical light appeared right beside the first. Indistinguishable with the naked eye, these balls were obvious pairs through the telescope. These balls would then begin varying in brightness, one going dim while the other brightened, and then the first brightening while the second dimmed. After eight to ten cycles, the balls would usually split up, and separate into two naked eye pairs. This easily ruled out car headlights. Equipment: We brought a 4.5 inch telescope with 700 max magnification, GPS (Global Positioning Satellite system) and a pair of good binoculars. a. If these were fireballs of some type, then the area would be light up in circles of light on the ground, in this case we saw a stretch of light on the ground only in one direction. b. Natural gas burns blue with greenish tint, not yellow. Electric discharge is bluish as well. they not start a fire on this dried ground? More to the point, as we were setting up our equipment a train drove by. The train tracks and some of the bushes caught on fire. A crew of men were there within minutes extinguishing the fires. No one however seemed to be concerned about the farmland catching on fire during the light display. Why not? d. This entire light display was active from 8pm to 10:30pm. It was most intense while a busload of retired folks arrived at the scene. These are our observations so far. We will bring an inferred camera with a super zoom next time. If these are cars, they will shine brightly and the details will be so good that we will be able to recognize the faces of the drivers. We will then expose then this entire hoax on the Internet. I will gladly apologize if we are wrong. ((http://www.tje.net/para/terms/marfa_lights.htm Daniel. - 09/20/98 marfaL12.html ) Note: The full name of this reference is not available for some reason, and the 'Paranormal Research News' web site will not supply it, so there is no way to verify its authenticity. 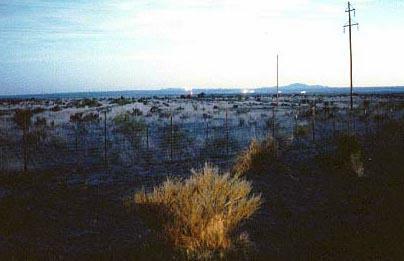 57... On Saturday, February 2, 1991, I visited the Marfa Lights viewing area east of Marfa on Route 90. I brought with me a good quality pair of 9x35 binoculars and a simple homebuilt receiver for audio frequency electromagnetic radiation, similar to radio signals but at much lower frequencies. My reason for having with me such a receiver was that atmospheric electrical phenomena are known to operate at such frequencies in some cases, and I wondered whether there might be a connection between such radiation and the Marfa Lights. I arrived at the Marfa Lights viewing area, parking at the far right at about 5:30 in the afternoon, while the sun was still low in the sky. At this time the weather was clear and dry, with a dark cloud bank low on the distant west horizon. My intent in arriving this early was to gain familiarity with local land features in daylight so that I could more easily interpret the positions of distant lights after dark. Using the binoculars occasionally as darkness gradually descended, and ranch lights and automobile headlights switched on, I quickly learned to identify each by their position and appearance. The ranch lights were still and constant in brightness, and were either white or blue in color. Most of the visible automobile headlights were from northbound traffic along Route 67, 20 to 25 miles to the southwest. These moved at an apparently steady rate in a northward direction, following a constant path that gradually descended toward the north, and were white in color. These lights appeared to vary in brightness, evidently due to roadside obstructions and veering angles along the distant curving road. Along this road there were several points at which headlights often seemed to flare up brightly, no doubt as the road path directed the headlights toward my position. I tracked several automobiles as they followed the distant road, and soon I could accurately anticipate how the apparent headlight brightness would change as the automobiles proceeded. Seated in my parked automobile, using the binoculars, I continued to examine the landscape in this manner until daylight had almost completely faded. At several minutes before 7:00 P.M., I suddenly noticed a rather bright light to the west-southwest, north of the region where the automobile headlights were visible. I had seen no light in the same vicinity prior to that moment. The light attracted my attention mostly because of its color which was brilliant yellow, unlike the other lights I'd been examining. I carefully situated the binoculars on the headrest of the passenger seat next to me, so that they were quite stable and directed toward this new light. Although it was late dusk, I was still able to see a nearby utility pole in the same field, providing me a fixed reference point with which I could gauge the light's movement. Initially the light did not appear to move, but there did seem to be a slight erratic variation in its brightness. As I stared at it through the binoculars it began to move slowly to the north. It remained brilliant, perhaps somewhat brighter than the brightest headlight flashes I'd seen along Route 67, but it continued to flicker slightly and irregularly. The light gradually seemed to gain speed somewhat, then it gradually slowed as it passed behind the nearby utility pole in front of me. As it emerged from behind the pole it slowed to a halt, and remained stationary for half a minute or so. Then it slowly began to rise and move back toward the south, back behind the utility pole and past it to the south. It had by now ceased rising as it moved laterally southward, still flickering but it was now generally gaining brightness. I was puzzled by this light, but I had not yet been able to decide whether I might be seeing another automobile headlight. And then, as I stared with great surprise, the light divided into two separate lights which continued to move southward and gradually drew apart. At this point I glanced at my watch, noting the time at 7:08, so I had watched this light for about ten minutes. As I continued to watch what was now a pair of lights, the leftmost one (to the south) flickered a bit, quickly increased brightness, and divided again. At the same moment, the rightmost light of the original pair (to the north) abruptly changed direction, began to move away to the north accelerating to a speed much greater than any automobile headlights I'd observed earlier, and gradually faded in brightness. It vanished about as it reached a point due west of my position, almost in line with Route 90. By then as I looked back toward the other pair to the south, yet another similar light had appeared, and the erratic movement and varying brightness continued. I watched what seemed to be a fairly continuous display of this light behavior for another twenty to thirty minutes. I recall seeing as many as five lights at one time during this phase. I noted that the central point of the display seemed to be moving gradually toward the south. During the entire performance I could observe slowly moving automobile headlights in the distance which were distinctly different in appearance from the lights to the north that held most of my attention. Gradually the lights faded away, and by about 7:35 it seemed to me that only ranch lights and a few distant headlights remained. As these peculiar lights were fading, several other automobiles arrived at the viewing area, parking to my left. So I got out of my car and strolled over to greet the new arrivals, who were also standing outside their cars. I asked if any of them had seen the lights, and was startled to hear that they were still visible. I looked around to see that indeed the performance had resumed, but perhaps even more extravagantly than before. There now seemed to be generally more lights visible at once, and these had moved further southward toward the distant headlight track along Route 67. Moving headlights were visible along with these anomalous lights, but were easily distinguished due to their color, motion and brightness variations. Use of the binoculars made the distinction much easier to perceive. The others present were evidently seeing just what I saw. There were two who seemed familiar with the phenomenon, whom I assumed to be local residents, and several others who seemed to be tourists. There was an open discussion among the group of what each person was seeing; all reported seeing exactly the same light behavior, and all reports agreed with what I saw through the binoculars. I then returned to my automobile to continue observing the performance, which continued for perhaps another twenty to thirty minutes. Finally these lights again faded, at about 8:00 P.M. I remained and watched carefully for further appearances. During this period I was still able to see all the ranch lights and distant automobile headlights, but I saw nothing else that resembled those lights that moved erratically and glowed with the often brilliant, flickering yellow light. During this hour the other visitors evidently lost interest and and gradually departed, as did I at around 9:15 P.M. I noticed rain appearing on my windshield even before I arrived at Marfa ten miles to the west, and the rain continued intermittently for most of the night. During the hour between 7:00 and 8:00 P.M. I observed a display of evidently inexplicable moving lights that was nearly continuous and fairly complex from time to time. At some points the scene rather resembled a three-ring circus, as there was more concurrent activity in different directions than one could fully follow. I recall at least six instances of seeing a single light divide into two that gradually moved apart. In one of these instances the two moved quite some distance apart, perhaps six degrees from my viewing position, and then both reversed their motion and moved back together. As they met, the one on the right appeared to spiral upward abruptly, seeming to circle above the one on the left, flickered out and vanished. I observed several instances in which a light vanished abruptly, and another appeared abruptly at a distance of several degrees laterally from where the light vanished, seemingly at the same moment. If the light actually moved the distance, it did so at a speed so great that I could detect no trace of any motion. In one case I noticed a barely visible, dim deep red light appearing to move southward from one light toward another adjacent to it. These two were each a brilliant yellow, and I believe they had emerged when an individual light divided. As the faint red light approached the vicinity of the leftmost bright light, it flickered and suddenly flared up, changing color to the same brilliant yellow as the other two. It moved past the leftmost light and proceeded gradually southward. At most times during the hour-long display multiple lights were visible. The individual lights would sometimes hang motionless for short periods, but most of the time they would move. Such movement was generally erratic, involving both gradual and abrupt changes in speed and direction. The lights appeared to move both horizontally and vertically, but individual lights always seemed to move over much greater distances horizontally than vertically. So far as I could determine, this motion exhibited no directional preference. Motions of individual lights often seemed independent of other lights, but there was an apparent tendency to form straight lines of equally spaced individual lights which would often seem to move together as a group. At one point I counted as many as six separate lights visible in such a line for a short time. I noted cases of different lights moving apparently independently that would abruptly move into a straight line formation, and cases of individual lights departing such formations and diverging off independently. In one startling instance, an entire row of four or five bright lights disappeared from view at the same instant, evidently extinguished as though controlled by a single switch. And then, after only several seconds, evidently these same lights began to switch back on, but this time individually in no apparent order or pattern. None of these lights ever seemed to be very close to my viewing position. I doubt that they were closer than several hundred yards, nor further away than perhaps fifteen miles. The lights were not beyond the hills in the distance, as at times they appeared in the foreground against them. Nor can I make any reliable estimate of their physical dimensions or altitude, except to observe that they never appeared to rise very far above the horizon along the distant hilltops. Some lights glowed steadily for fairly long durations, but they usually would flicker and brightnesses would vary irregularly and erratically. I did note one thing that may have been a significant pattern. Prior to the moment that I observed an individual light to divide into a pair, in each case I recall, the original light rapidly grew very brilliant. I began to anticipate seeing a light divide when I noticed this quick brightening, and it usually did so. The binoculars I used displayed a 7.3 degree field of view. At a distance of twenty miles, for example, the width of the field would be about two to three miles. At most times the multiple light displays could be observed entirely within this field of view, but in a few cases individual lights were spaced at extremes beyond this limit. I noticed that the central point of the display of multiple lights seemed to be quite stable. This point was initially west- southwest from my viewing position, but gradually drifted to the south so that it was southwest by the time the display finally faded an hour later. In my judgement I was watching neither ranch lights nor automobile headlights, and the others present unanimously agreed. I spent about three hours watching the same vicinity. During the first and third hours I saw many lights, all of which appeared to be ordinary ranch lights and headlights. These same lights were fully visible during the second hour, but something strikingly different from these was also visible. Virtually all of the automobile headlights I saw appeared to move at slow, near-constant speeds in a northward direction only. These other lights moved erratically, often shifting speed and direction. The patterns of movement I saw were inconsistent with any reasonable explanation involving automobile headlights, and the colors of the two were quite distinct to my eye.